A day after India made grand celebrations of their 500th Test, there were potentially embarrassing scenes of the ground staff just standing on the covers in the bright sunshine and not knowing what to do. An hour-long spell of rain, which began as a fine drizzle for the first 10 minutes and was an even finer drizzle in the last 10 minutes, ended up washing out the final session. It began to drizzle just as the players walked off for tea at 2.10pm, and the ground staff was out on the covers at 3.10pm. At an inspection at 3.50pm, the umpires asked the curator how long it would take to get the ground ready. When he asked for another hour and a quarter, the day's play was called off. These two teams have been witness to much worse in their recent Tests in the West Indies and South Africa, but the spectators were left wondering why the ground staff didn't even try to get the covers off in a hurry. On the surface the whole process looked really inefficient and amateurish, not to mention inexperienced. However, leeway has to be made for the facts of this case too. Green Park is an old ground owned by the government so there can't be any structural improvements made to its drainage. At least the BCCI can't do it. 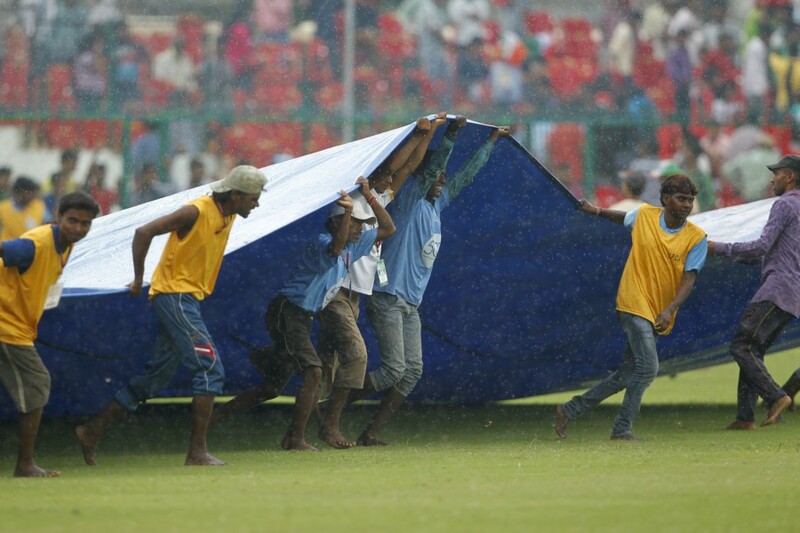 The ground staff, BCCI's employees, were now left with the task of getting the covers off the field without spilling any water onto the ground. They have two super soppers but decided against using it because according to them there was just too much water on the covers. The big drawback was the LED advertising boards about five metres behind the rope. The boundary triangles proved to be a hindrance too. Had they been able to use the 30 metres behind the boundary boards without having to skip over the foam triangles, they would have been able to throw off the water much faster. One member of the ground staff said they tried to get it done, but couldn't. They didn't make any guarantees they would have been able to make play possible, but admitted the process would have been much faster had the advertising boards been removed. With things standing as they did, the ground staff had to take extreme caution because spillage on this ground with no drainage underneath could have resulted in substantial loss of play on the third day. That doesn't absolve them of the lack of alacrity in getting the covers on - it took them 15 minutes to get them on, and when it was pouring they were still readjusting the covers. At one point, once the rain had stopped, some groundsmen stood with covers in their hands and nothing to do for close to 10 minutes. While there can be leeway given for no play after tea, there cannot be any for the fact that even 20 minutes after the play was called off, there was no announcement made to the effect. The big screens showed just the score, and the crowd still kept waiting in the stands, braving the heat after having somehow sat through the rain. It was only when the commentators came on to the field for their post-play analysis that they decided to leave. A day after the 500th Test celebrations, when the BCCI should have renewed its commitment to the fans who have made the journey possible, they remained last on the priority list.